Our son Chris moved back home after college, as is quite common these days. His goal was to save enough money so he could buy his own home and move "back out of the nest". 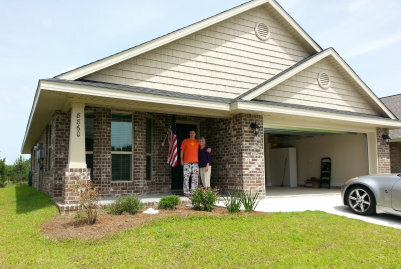 Over the next 3 1/2 years, with a good job and a lot of discipline, he saved enough to put 25% down on a new home and qualify for a 15 year loan. Construction began in August of 2016. 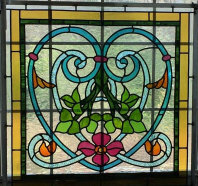 He was able to get the builder to add a 48" x 48" clear bathroom window that we thought would be perfect for a magnificent window. One day while on a stained glass forum on facebook, I spotted what I thought was the perfect concept for my son's glass. 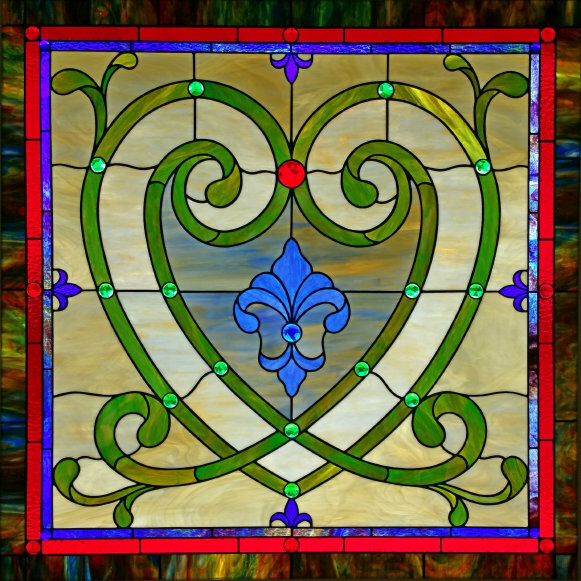 An artist named Tina Dodge in Virginia had just completed a window depicting 2 intertwining hearts. See the photo on the left. Since my son was embarking on a new phase of his life and also was in a serious romantic relationship, something about this concept just grabbed me. Our son's new home was finished in late April, but since his Dad is rarely on schedule, his window wasn't finished until June.